Philadelphia, PA – Philadelphia’s leading health insurance organization, Independence Blue Cross (Independence), and one of the largest health care systems, Jefferson (through its Innovation Pillar), will host a free Health Hack (#healthhackPHL) Nov. 13-15,designed to help reinvent health care access and delivery by creating innovative solutions to the biggest challenges in the industry today. The event, to be held at Jefferson Alumni Hall on the campus of Jefferson University Hospital, will attract health care professionals, designers, programmers, nurses, engineers, and students excited to share and develop new ideas and have access to mentors, skill-based workshops, and hands-on tools to help make them a reality. Additional sponsors include Comcast, IBM Microsoft, and DroneCast. A hackathon brings together individuals who may not interact otherwise in order to inspire creative thinking and scalable solutions. This Health Hack is different because of the complex issues it tackles through the following three tracks. In addition, this will be thefirst known hackathon to present a track focused solely on drones. Drone-Based Health Care Delivery (sponsored by DroneCast and IBM). The goal of this track is to allow imaginative and ambitious people to prototype drone-based solutions for the health care sector. DroneCast of Philadelphia will provide several of their 44 types of drones with which to create, as well as on-site technical support. Wearables: Helping Patients and Providers Gain a Better Understanding of Individual Health (sponsored by Comcast and Microsoft) From fitness trackers to Google Glass, wearables have become major parts of daily life, and the health care sector is no exception. The Wearables track focuses on applying these diverse technologies to help patients and their providers gain a better understanding of their health. Improving Patient Experience: Reducing Hospital Readmissions (sponsored by Independence) According to a 2013 report by the Robert Wood Johnson Foundation, 1 in 8 Medicare patients were readmitted to the hospital within 30 days of a surgical procedure while 1 in 6 returned to the hospital after receiving medical care that required a hospital stay. With the Medicaid and Medicare funding now tied to readmissions metrics in the Affordable Care Act, health care systems are looking to innovate their processes and procedures to keep their patients healthier after hospitalization. In addition, teams have already formed to work on other ideas. In the Drone track, the White Helmets, an Istanbul-based non-profit, is forming a team to develop new approaches to rescuing victims trapped in rubble from disasters. Two local fabricators are interested in building a collapsible bike helmet as part of the Wearables track. Ayesha Khalid, M.D., M.B.A., part of the MIT Hacking Medicine leadership team and advisor to the Health Hack. Sponsors will provide products and other resources for participant use throughout the weekend. NextFab, a maker-space and prototyping studio in South Philadelphia that specializes in design, engineering, consulting, and fabrication, will also offer use of its facility’s 3D printers, laser cutters, expert woodworking, and other services. Winners of each track will receive prize packages from the event sponsors, including cash as well as access to strategies, insights, and individuals to further explore the potential of turning ideas into reality. 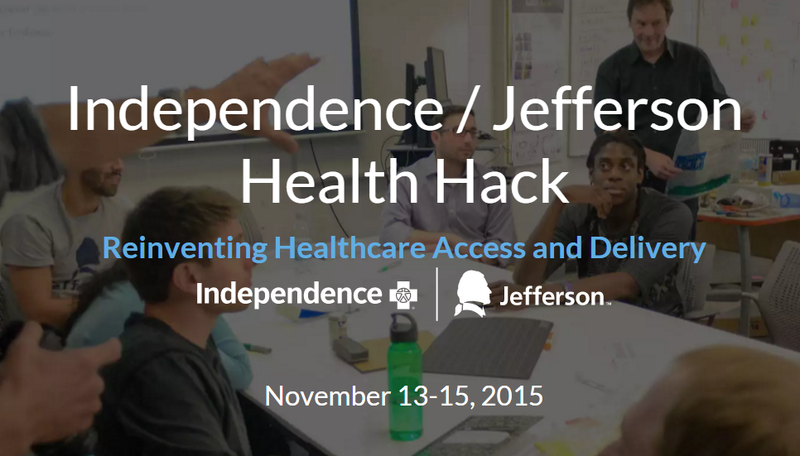 The Health Hack is part of the new collaboration between Independence and Jefferson designed to boost innovation in health care through a variety of programs and help both organizations improve the quality and value of heath care. Established in Feb. 2014, Independence’s Center for Health Care Innovation houses a wide range of innovation initiatives and champions health care entrepreneurism in the region. Jefferson’s Innovation Pillar is an initiative to elevate and lead innovation as a mission for the university and health system.